If you have that strongest of urges to catch up on your college-time fitness but your daily office schedule (sitting at work desk for 8-9 hours) spoils this dream of yours, you need not worry a single bit anymore. The treadmill desk is an innovatively designed work desk that has a treadmill and a work desk integrated together. 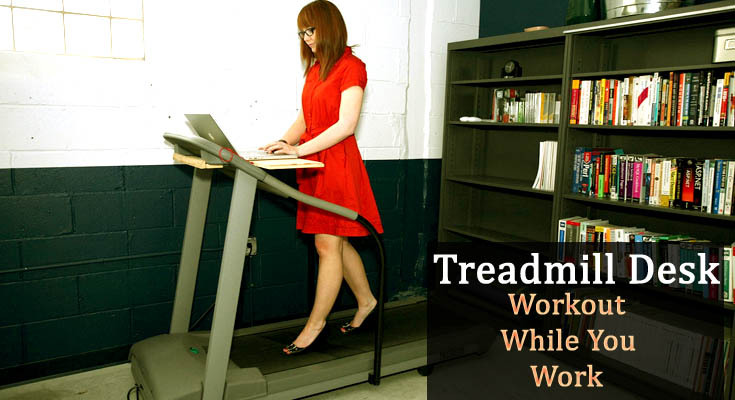 A treadmill desk allows you to “Workout with Work”. You can easily walk 15000 to 25000 steps per day and burn enough number of calories, while working in the office. Yes you can work on a Treadmill Desk! The studies as well as users’ reviews say that you can concentrate perfectly on your work, while walking on a treadmill desk. It is just your feet, which are moving in a smoothly synchronized manner while your eyes and mind are stably focused on the monitor placed right in front of you. Just because you are working from a treadmill desk, doesn’t mean that you have to walk continuously as long as you are working. You can simply switch off the rotating deck and work standing. In fact, for that matter you can even step down, sit and relax whenever you feel like. The first and foremost thing you must keep in mind is that you are not buying a professional treadmill, but Treadmill Desk where a standing desk designed to work with a treadmill deck. So, it has to cost lesser as compared to a professional treadmill. A standard treadmill desk costs from $400 to $3000, depending upon the features and technical functionalities incorporated within the machine. Another important feature to consider before buying a treadmill desk is how much can you adjust its height? Ideally, you would like a treadmill desk whose height you can adjust anywhere between you comfort extremes. Moreover, there are both automatically and manually height adjustable treadmill desk. While in most of the cases, the automatically adjustable treadmill desks provide a big range of vertical movement, the manually adjustable treadmill desks allow a maximum of 1-2 inches of adjustment variations. It is always nice to have a little display on the machine, which lets you keep track of your daily workout like the distance covered, calories burned, pulse rate etc. Moreover you would love to a connectivity medium such as Bluetooth that enables data sharing and lets you export your daily stats from the machine. Being and electronic item, there is every possibility of a mis-happening in the inner circuits of the treadmill desk due to some voltage fluctuation or any other reason. So, just make sure you buy a robust one, which is also covered under a fair period of warranty. Depending upon your work, the space you require on the table may vary. Checkout for the dimensions of the table and make sure it has enough space to accommodate your laptop/desktop and other gadgets as well, otherwise shifting your gadgets again and again may well prove to be a mess for you.